 Engaging reminiscences from an aging writer for whom the national pastime has been, if not a grand passion, at least a serious preoccupation. 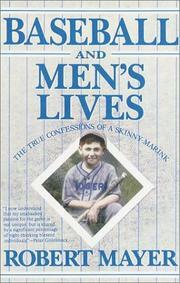 By making baseball the focal point of his evocative memoir, the fiftysomething Mayer (The Dreams of Ada; I, JFK, etc.) can lay claim to spiritual kinship with all American males who ever aspired to major-league stardom and settled for the sidelines. Looking back on the pre-TV days when he roamed N.Y.C. 's rough diamonds as a scrawny shortstop, the author recalls the pleasures and pains of rooting for the Brooklyn Dodgers, an aberrant choice for a Bronx- born lad whose immigrant parents lived within walking distance of Yankee Stadium. Mayer's loyalty to the team did not survive the franchise's flight to Los Angeles; as a young newspaperman, however, he found it possible to transfer his allegiance to the Mets. The expansion club's championship season in 1969 played causal roles in a failed first marriage and a subsequent move from alarmingly violent Manhattan to the backwater security of Santa Fe, New Mexico. While working at the novelist's uncertain trade, Mayer followed his hometown squad on television, found a new love, took a whirl at twilight league softball, and otherwise got on with a productive life. At the close, he's reveling in the arrival of the Colorado Rockies in Denver, a city within striking distance of his southwestern home. An unabashedly sentimental journey with a grown man who understands the summer game is as much about continuity, ties that bind, lost youth, and broken dreams as hits, runs, errors, or other hard numbers. Fine fare for fans old and young.